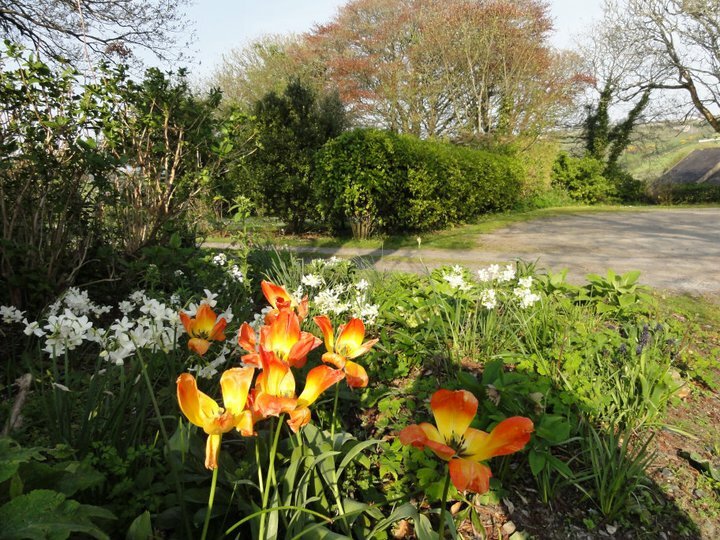 Since arriving here in 1989 we have gradually landscaped and designed a series of gardens that are central to everything we do at The Glebe. Our large ornamental vegetable garden produces a wide range of salads, greens and other vegetables, herbs, fruit and flowers, for the café and the family. Combining vegetables with flowers and herbs helps us to create a beautiful micro environment, encouraging bees, butterflies and other beneficial insects that are essential to our sustainable and environmentally benign system of growing food. Behind high protective hedges adjacent to the vegetable garden lies a medicinal herb garden which is largely planted through gravel. We have many rare herbs growing alongside the more usual lavenders, thymes, sages etc. In high summer this is a lovely tranquil place to sit. Below the herb garden are two long herbaceous borders, designed to complement the peace and tranquillity of the herb garden, using mostly pastel shades and scented flowers. Around these gardens are areas of woodland planted as windbreaks and protection. After twenty odd years, some areas are now quite mature and we are lifting the canopy of branches to allow us to under plant with interesting shrubs and perennials. Over the bridge, in the old meadow overlooking Church Strand Bay, is The Amphitheatre. Built in 2004, in memory of Mr Peter and Mrs Gwendoline Harold Barry, the amphitheatre is the venue for music and plays, wedding ceremonies and other happy occasions throughout the summer. Some areas of the garden are particularly beautiful for short periods, an example is the Iris Garden, an avenue of Betula jacquemontii under planted with Iris sibirica, sublime for three or four weeks from early May. But from Tulips through to late summer Dahlias, and from spring salads to autumn harvests, the garden continues to give us all inspiration and sustenance throughout the year.